Weekend forecast: Tornadoes in Oklahoma, snow in the Black Hills, and a tropical storm hits the Carolinas. 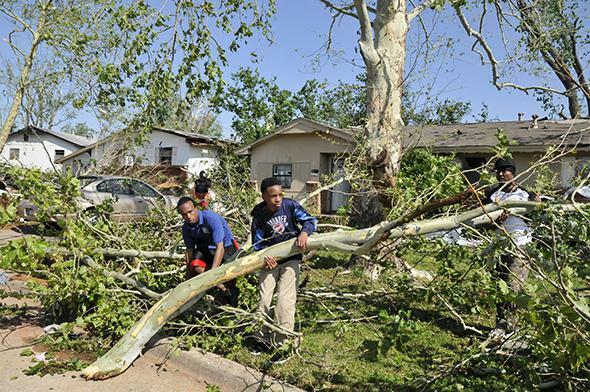 Alan Phillips (L), Nsilo Hunter Jr. (C) , and their father Nsilo Hunter Sr. work to clean up fallen tree limbs from their home that was hit by a tornado in Oklahoma City, Oklahoma May 7, 2015. America’s got a plethora of atmospheric oddities on offer this weekend. First up, tornado watches are currently in effect for parts of Oklahoma and Texas, still dealing with the aftermath of tornadoes and record-setting rainfall earlier this week. On Twitter, Rick Smith, a meteorologist at the National Weather Service in Norman, Oklahoma, called Friday’s outsized severe weather risk “one of those days” to pay attention to. His office was preparing to launch a special weather balloon to gather more data about the building tornado threat. Saturday’s risk might be even greater. The Storm Prediction Center, the nerve center of the National Weather Service’s severe weather forecasts, called Saturday’s threat “substantial” in its latest outlook. The SPC took the rare step of upgrading Saturday’s tornado chance to ‘moderate’, the second-highest level, three days in advance. An objective pattern-matching tool from Saint Louis University has highlighted a few significant historical analogs that match Saturday’s expected weather map, including large-scale tornado outbreaks in mid-April 2012, early May 2003, and late May 2011. Meanwhile, the same storm system could create near-blizzard conditions in the high plains of Wyoming and South Dakota, bringing more than two feet of late-season snow to the Black Hills. And then there’s the rare Subtropical Storm Ana that’s formed just off the coast of the Carolinas. There have been only 15 similar storms during the month of May in the Atlantic Ocean since hurricane records began in 1842. Ana shouldn’t cause much of a headache, however. It should make landfall by Sunday near the South Carolina/North Carolina border, bringing a few inches of rain and breezy winds, before quickly moving up the East Coast. Its biggest impact will probably be to limit what would have otherwise been a beautiful early summer weekend. The Weather Channel’s superstar meteorologist Jim Cantore began Friday on the beach in North Carolina, his earliest ever live shot during hurricane “season”—which doesn’t even officially begin until June 1st. But Cantore will travel to Oklahoma on Friday to chase the weekend’s possible tornadoes.